Click here to see the patternlets available for purchase! These are free ideas to help you extend the use of your WB patternlets. 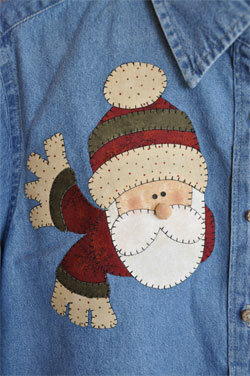 Appliques can be used on so many things, so use your imagination and go crazy! Patternlets are also smaller than regular patterns and can fit in a standard size envelope. So send them as greeting cards to all your quilter friends! The gift that keeps on giving! I purchased a pre-made denim bag from my local craft store and appliqued the pumpkin to the front (I used the machine to put on the buttonhole stitch. It was just a matter turning the bag so there was nothing behind it. Sew, turn, sew, turn, etc. It was actually a lot easier than I thought it would be) Then I cut a strip of orange fabric 2 1/2" wide and enough length to get around your bag plus properly overlap in the back. Turn the strip with the wrong side up and fold the front edges of the strip to the back and meeting in the center. Iron all edges. (Be sure to turn under one end of the strip and press. This will be the edge that overlaps the other edge in the back of the back to give it a nice, clean finish.) Pin the strip to the top edge of the bag, and sew a seam along the top and bottom edge. Embellish with buttons. Make your favorite patternlet into a curtain or valance. You can also mix patternlets- for instance, use P05 Pumpkin and P06 Turkey for great Thanksgiving decor. I made this one a double thickness (the back is lined with the same orange fabric as the top of the valance) Depending on how much ruffle you want, measure your window and make the width of your valance either 1 1/2 or 2 times this length. 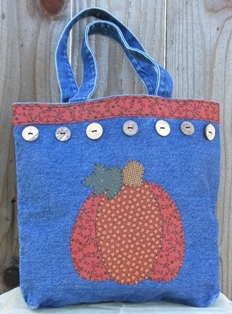 Use this pattern to make a gift bag to put your towel or other goodies into. Simply trace the patterns onto paper or cardstock (you will probably have to make templates first to trace around), cut out, and glue onto a paper bag, a gift wrapped in kraft paper (and write To: and From: on his belly) or even size down on your scanner or at your local printing or office store and put on the front of a blank card! Use this pattern to make cute, little ornaments for your tree or as gifts. You could even make a towel, roll it up, and attach an ornament to the front with raffia or ribbon. To make these, simply follow the directions on the pattern, except cut the large square to 3 1/2" for seam allowance. I used very thin jute or hemp string, but you could also use thin ribbon. I loved this one! Easy and a great gift for friends, teachers, and kids! Cut two pieces of black fabric to 5.5"x8.5". On one piece of fabric, place your Candy Corn (follow patternlet directions) on top, approximately 1-1/4" above the bottom edge and stitch using a buttonhole stitch. Lay one piece of fabric on top of the other with right sides together. Using pinking shears, cut the top edge of the bag (one of the 5.5" sides). Sew a 1/4" seam along the two, long sides and the bottom. Turn the bag right sides out and fill with your goodies. Tie 1 piece each of a brown, orange and black ribbon into a bow to close the top. For the tag, I just printed "from one "corny" friend to another" on the computer, cut into a rectangle and clipped the top corners to resemble a tag. Punch a hole to run one strand of the ribbon through and age the edges using a brown ink pad. This is super easy and a great bag to put the matching towel in as a gift! It is an 8x10x4.5 kraft paper bag. The orange background square is cut to 5x5 and the smaller black square is cut to 4x4. Both squares are adhered using fusible web, just like the candy corn. There is no stitching involved, just use a thin, black marker to write the words "From One Corny Friend... To Another!" Add one orange and one black ribbon tied around the handle. This one combines P08 Candy Corn and P09 Gourdy patternlets to be used on a 16"x16" pillow form. These instructions are longer, so just click on the picture to the left for a printable page. This one's super easy using one tea towel and one 12"x16" pillow form. Just click on the picture to the right for a printable instruction page. And we DO mean alternative! This was actually one of the designs I was trying out for the actual patternlet. After many belly laughs over the phone, my mom and I decided maybe everyone doesn't share our sense of humor. But, I couldn't NOT put it out there as an option! The udder pattern piece will be on the printable pdf for you to trace. After clicking on the picture, the page should come up in Adobe. Print the page and make sure the length of the Udders on the straight edge measures approximately 9.5". Cut out two of everything and apply to the denim shirt. I actually made the stems longer than what was on the patternlet, that way I could place them on the shirt as I liked and cut off the excess. Longer shirts may require longer stems! Use these to line a basket or hang over the edge of a table or shelf. The liner is easily made using two pieces of fabric cut at 20" square. Put the two pieces right sides together and sew around leaving an opening. Then turn right-side-out and sew the opening closed. 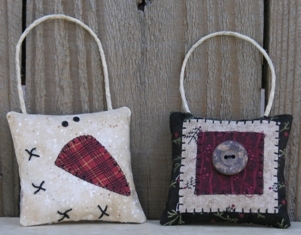 These little pillows are just the right size for a gift, and very simple to make. 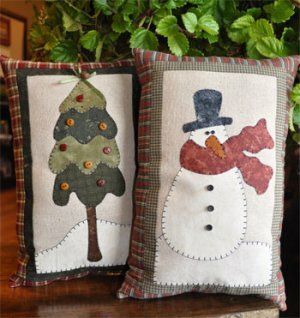 The two pillows shown are made using TWBP18 Snowman & Tree patternlet, but you could really use just about any of the patternlets. I could even see the TWBP14 Bumble Bee for spring, or turn the pillow sideways and use the TWBP10 Snowballs or TWBP08 Candy Corn. As always, use your imagination! There are so many patternlets that would look good on one side of a denim shirt front, or all along the bottom, etc. Then add your own embellishments and trim. 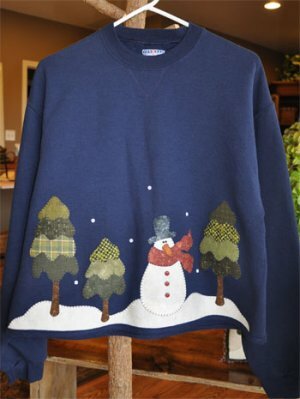 And don't forget to mix-n-match some of the patternlets, like the two different snowmen (P01 and P18), the trees(P18), the penguins (P02) to make a great all-winter shirt!